Il Sette Di Friggitrici was created in Cinema 4D. Points of inspiration were industrial designs of the golden(-baked) age of western consumerism: the mid 20th century. Including a plasticky backlot inspired by the studio-sheltered landscapes from the original Star Trek show. The 3D models for the rocks were found on thingiverse and were created by user “dutchmogul”. 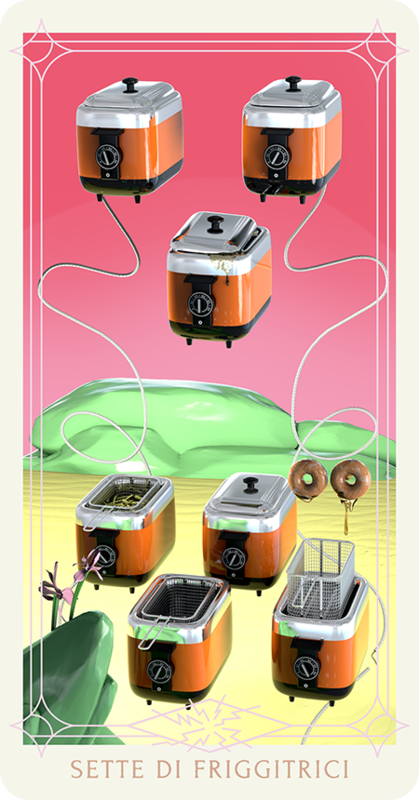 Joel reports: “I recently dreamed about a tarot card: the seventh card from an apparent suit of home fryers.” This was an amazing enough sight to remember and recreate. My previous interest in the tarot cards has been limited to moderate amusement by its mystical context. They’re easy off-the-shelf props to indicate “something occult” and their wild colorful imagery usually has a fun theatricality about it. Rebuilding the seven of fryers from memory urged me into a minimum of historic research. That the tarot was originally intended as a deck of playing cards (traced back to the 15th century) has been vague trivia to many –including myself until now– almost as a mere side-note to the cards’ generally accepted fortune-telling purpose. However, “reading” the cards’ iconography in order to predict the future or for any other sort of pseudo-psychoanalysis (pardon the alliteration and potential pleonasm) has been a fairly recent phenomenon, as is the faux-ancient symbolism of the currently most famous set of cards, the Rider Waite edition (link). The tarot cards were never really supposed to hold any arcane knowledge or gateway into the supernatural –at least not beyond the mild allegorical genre of visualisation, hardly crazier or more mysterious than most other standard medieval/renaissance catholic imagery. It was just a game. We’re entertaining the idea of dedicating a very short animated documentary to the gameplay history of tarot. Games are still becoming increasingly prominent as an overwhelming force in visual culture –and therefor as a social agent. The tarot is characterised by its striking figurative imagery (compared to the older, but more graphically abstract “regular” playing cards, as used in poker, bridge, etc). The structure of the tarot deck has remained more or less unchanged throughout the centuries, which gives fascinating insights into the evolution of the specific cards/themes’ design. Oddly accurate, as will testify any owner of a small mischievous black cat. 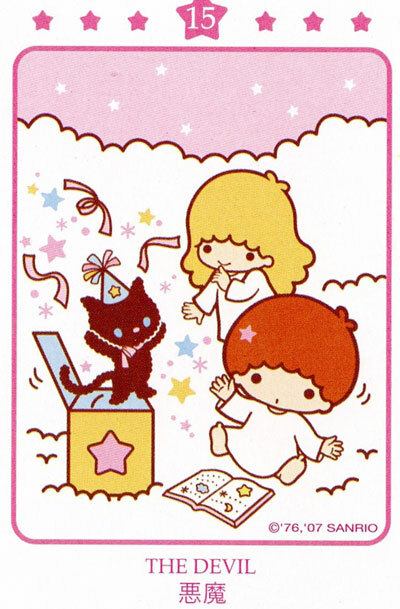 From an article about the emergence of tarot in Japanese popculture. Click image to be redirected. While the occultist appropriation of tarot has probably saved it from disappearing from the public eye as some vague curiosity (traditional gameplay remained popular only in a few specific regions), it didn’t help its reputation as a subject that merits the same serious academic attention as, for instance, other theological art from the same timeframes. Tarot decks are being produced now, more than ever. Rather than just a novelty product, they can be used as an actual playable game. Enthusiasts should note that there is not necessarily anything about the seven of fryers identifying it specifically as a tarot card. It could belong to any sort of four- (or multi-?) suited games. The tarot family differentiates itself from other games through the addition of a fifth suit of trump cards, in which every card shows a unique scene, without being part of a hierarchy under a common suit symbol. 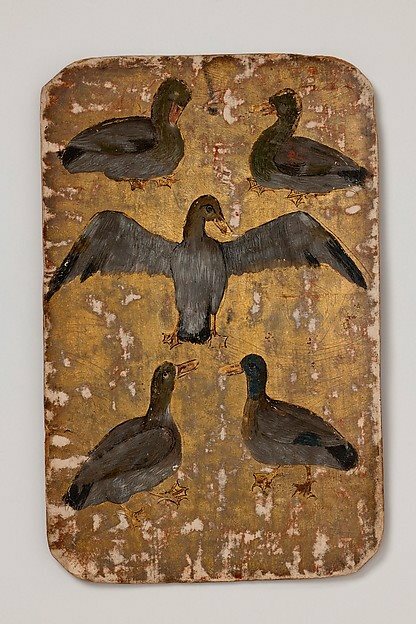 The latter form can appear in many variations: the 15th century Stuttgart deck, for example, wonderfully contains a suit of ducks. The suit of fryers could be part of a non-tarot deck, since there is no indication of an additional trump suit. As is often the case in dreams I merely “knew” the seven of fryers is tarot. This in itself is a very esoteric state of affairs. Five Of Ducks, from the Stuttgart deck.